When Planned Parenthood started putting up billboards in Idaho, I knew we had to do something. So, a handful of mothers and I raised $37,000 in 14 months to put up six pro-life bus- stop signs, two rotary billboards, and two bus-tailgate signs. Nineteen years ago, I experienced a crisis pregnancy. I feared telling my mother most. That message—”Your mom wants to be a grandmother, just not now”—seems innocent, but the message’s subtext is “If you get pregnant, get an abortion because your mother’s not ready to be a grandmother, and you don’t want to upset your relationship.” In my case, my mom was beside herself for a couple of weeks. She was angry and worried about how I would care for a baby by myself, living two hours away. The message that Planned Parenthood’s billboard wasn’t conveying to young women is that your mom will get over the shock and will love the baby like her own. That unplanned baby will be a healing balm and gift from God that will make both women stronger. I know, because my mom and I lived it (see Celebrate Life, January-February 2009). After I began mulling over how I could put up pro-life billboards in our community, I called Karen Simkins, director of Boise’s 40 Days for Life campaign. We discussed teaming up with local crisis pregnancy centers and what phone number to put on the billboards. The problem was the manpower required for a 24/7 hotline number. It turned out that Birthright already had such a number and its Boise office had a volunteer, Irene Deely, who also was eager to get billboards up in Treasure Valley. In April 2013, Irene, Karen, and I met and formed the Treasure Valley Pro-Life Billboard Campaign. There was a poetic beauty to this partnership, because another Birthright office had provided practical and emotional support throughout my own unplanned pregnancy. We decided to start small by putting up pro-life bus-stop signs, surmising that by getting those signs up, donors would see we were serious about spreading a pro-life message. A week after our meeting, my four kids and I went to Iowa to help care for my father, who was losing his fight with bone and blood cancer (he died in March 2014). At this point, I could easily have said I didn’t have time for the campaign. However, I felt prodded by the Holy Spirit to persevere. Irene and I began looking for just the right images. Irene is a professional artist and I have an art background, so we felt confident we could create a powerful visual campaign. I found a free rudimentary billboard design program, and put together a simple design for Irene, Karen, and some other supportive women to evaluate. Once we decided on images, the text for the signs flowed effortlessly. We surrendered everything to God. In June, the bus-stop sign company offered a 25-percent discount we couldn’t pass up, even though we were short by $1,700. Irene’s trust that we were doing God’s work was contagious: I charged the signs to my already-bulging credit card account. I typically worry about money matters, but this time I just trusted in God completely to provide the money we needed. It felt wonderful! In July 2013, just three months after our initial meeting, six bus-stop signs went up in Boise, Nampa, and Caldwell. In August, we started actively campaigning for money by meeting with area Knights of Columbus groups and protestant ministers, and anyone else willing to listen. We received a lot of generous support for our cause. One anonymous donor contributed $15,000, the Knights of Columbus’ Idaho State Council donated $2,000, the local Knights of Columbus—our heroes— donated thousands of dollars, and Birthright also donated a substantial sum. Churches, Catholic and nondenominational, donated money, and many individuals contributed. By September 2013, we received confirmation that our signs were having an impact. A young couple were on their way to have an abortion, but the girl remembered seeing a bus-stop sign displaying the message “Compassionate Care,” and so instead, they went to Stanton Healthcare, a pro-life pregnancy center located next to Boise’s Planned Parenthood facility. As long as our signs were leading women to pro-life pregnancy centers, they were fulfilling our mission. Since then, a number of clients have come to Birthright because they saw our signs. In 2015, Birthright’s intake form will be more detailed, in order to better determine the number of clients impacted by our signs and billboards. In November 2013, Birthright of Boise signed a contract with Lamar Advertising to put up two billboards that rotate to a new high-traffic location every 60 days. Even though we still needed to raise $5,800 to pay the campaign’s total cost of $35,830, Birthright’s board of directors approved the erection of the signs before all of the money was raised. By erecting the signs in winter, we could keep them up all year—at a discount and at cheaper winter prices. Both the bus-stop signs and billboards required a monthly payment, so this allowed us to get the billboards up and start raising money simultaneously. The first went up on the Feast of Saint Juan Diego (December 9, 2013), to whom Our Lady of Guadalupe (the patroness of the pro-life movement) appeared, and the second went up on December 12, her feast day. The timing seemed a sign of heaven’s blessing. Finally, in July 2014, we were able to get pro-life signs on the back of two city buses for a six-month period, for the low cost of $1,500, thanks to the St. Paul Knights of Columbus council in Nampa. We’re now fundraising for our second campaign, titled “She Was Unplanned.” We want to provide a positive message conveying that every unplanned preborn baby is a person, and like any other person, capable of growing into an adult. We’re featuring real-life moms and their daughters, and each mom has a powerful unplanned pregnancy story, which can be read on the Birthright.org/Boise website. In January 2015, thanks to the Our Lady of the Valley Knights of Columbus council in Caldwell, this message will go up on a bus-tailgate sign. God willing, other signs will follow. We consider ourselves God’s little worker bees. If we do the work, He will provide the capital to save lives and souls. We know there is a cumulative effect: The longer we reach out with a positive pro-life message, the greater capacity we have to save moms and their babies. To learn more about the Treasure Valley Pro-Life Billboard Campaign, visitBirthright.org/Boise or Facebook.com/TreasureValleyProLifeBillboard Campaign; call 208-342-1898; or write toBirthright of Boise, 1101 N. 28th St., Suite A, Boise, ID 83702. 1. Form a small task force to get your project off the ground. Choose people who are well connected with the community and passionate about the pro-life message. If you’re having trouble connecting with the right people, ask God for help! 2. 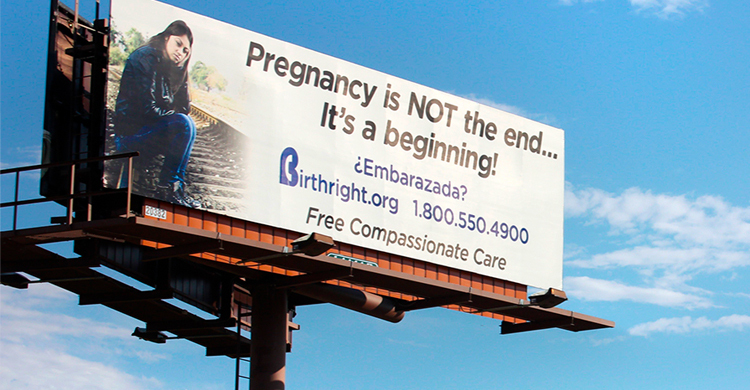 Partner with a crisis pregnancy center, because you’ll need a phone number on your signs and billboards. 3. Name your group, and develop a Facebook page and/or website. You can also set up an online donation link through Cornerstone Payment Systems (see CornerstonePaymentSystems.com). We stopped using PayPal for this when we learned that it supports Planned Parenthood. 4. Design a campaign by finding stock photographs on sites such as ShutterStock.com or iStockPhoto.com. The ad agencies will create the final design(s), but you must decide on your images and messages before- hand, as potential donors will want to see them. We spent $70 total on high-resolution images for our first campaign. But the photography required for our “She Was Unplanned” campaign increased our costs. 5. Get a lot of feedback on your images and messages to ensure they’ll be effective. We wanted our messages to be compassionate, be positive, and speak to women. We also wanted them to edify the pro-life community. 6. Consider fundraising through crowdfunding sites such as Indiegogo.com or GoFundMe.com. 7. Check bus-stop signs and billboards for ad agency phone numbers. Try to negotiate with the agencies for cheaper prices. Summer prices are typically higher, so buy during the winter months for the whole year. 8. When fundraising, contact your local parishes’ Knights of Columbus groups. Many will be happy to hear from you. Meet with the ministers of Protestant churches active in the pro-life movement. Contact family, friends, and acquaintances to explain your purpose and needs. Talk to anyone who will listen! 9. Last but not least, pray to God for guidance in everything, because a successful campaign requires His help!